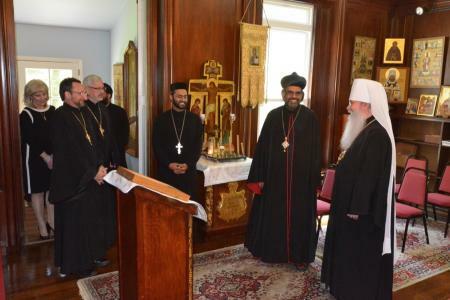 On Wednesday, May 18, 2016, His Beatitude, Metropolitan Tikhon hosted His Eminence, Metropolitan Zachariah Mar Nicholovos of the Northeast American Diocese of the Malankara Orthodox Syrian Church at the Chancery of the Orthodox Church in America. 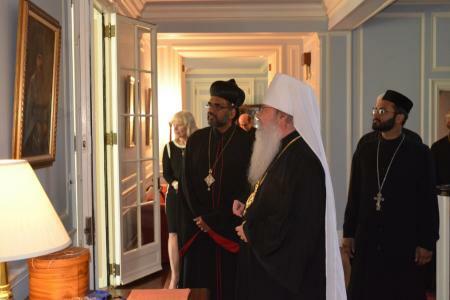 Metropolitan Tikhon welcomed Metropolitan Nicholovos, who was accompanied by Fathers Abraham George and Timothy Thomas, in Saint Sergius of Radonezh Chapel, after which they toured the Chancery and grounds. Among those present were the OCA’s Officers—Archpriest John Jillions, Chancellor; Archpriest Eric G. Tosi, Secretary; and Melanie Ringa, Treasurer—Protopresbyter Leonid Kishkovsky, Director ofExternal Affairs; and Archpriest Dr. Chad Hatfield, Chancellor/CEO ofSaint Vladimir’s Seminary, Yonkers, NY. 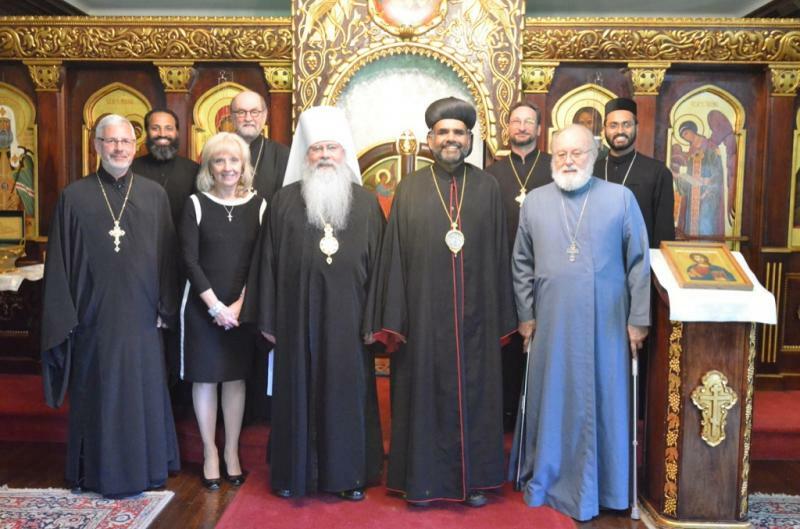 During a luncheon, Metropolitan Tikhon thanked Metropolitan Nicholovos for his assistance and guidance before and during his visit to the Malankara Church in Kerala, India to celebrate the 200th Anniversary of the Kottayam Seminary in November 2015. [See related story.] Accompanying Metropolitan Tikhon on that visit were Archpriest Dr. John Behr, Dean of Saint Vladimir’s Seminary Yonkers, NY and Archpriest Dr. Steven Voytovich, Dean of Saint Tikhon’s Seminary, South Canaan, PA.
Father Chad noted that some 60 Indian Orthodox students have attended Saint Vladimir’s, in addition to those studying at Saint Tikhon’s. Metropolitan Nicholovos serves as a member of the Saint Vladimir’s Board of Trustees. The ancient Malankara Church traces its origin to the Apostle Thomas. Headquartered in the southern Indian province of Kerala, it maintains about 1000 parishes in India and another 200 parishes in North America. This entry was posted in Featured News, News and tagged Archpriest Dr, Indian Orthodox, Malankara Church, Metropolitan Tikhon, Saint Vladimir by Orthodoxy Cognate PAGE. Bookmark the permalink.